The origins and interpretation of 13C nuclear magnetic resonance spectra are identical to proton magnetic resonance spectra. Though, they are generally simpler and thus simpler to interpret. This is because of the two major factors: (1) The low natural abundance of the isotope and (2) The mode of operation of the spectrometer. Both factors simplify the spectrum via preventing the splitting of signals through spin-spin coupling between nuclei. The natural abundance of 13C isotopes is 1.1%, which is; roughly one carbon atom in each and every hundred is a 13C isotope. This signifies that it is highly improbable that adjacent carbon atoms in a molecule will be 13C isotopes. As 13C nuclei don't absorb radio frequency radiation whenever put in a strong magnetic field, most of the carbon atoms in a molecule will be incapable of spin-spin coupling with any 13C nuclei present. Though, there will be enough 13C isotopes in all the molecules found in the sample to get an average absorption spectrum of all the molecules in that sample. This average spectrum is in effect that of a theoretically not possible molecule whose carbon atoms are all non-coupled to the 13C isotopes. 13C resonance takes place at a frequency of ~ 25.1 MHz whenever proton resonance is occurring at ~ 100 MHz. Therefore it is at lower energy than proton resonance and the spread of resonances for 13C is over ca 180 ppm; therefore there is less likelihood of overlapping lines in 13C NMR. The figure below illustrates the chemical shifts of some 13C signals. This is only an estimated guide. A 13C atom will couple to any protons linked to it example a carbon having one proton attached will appear as a double. Though to get the most information from the weak carbon spectrum, it is better if this coupling is eliminated. Carbon-13 spectra cover a much broader range of chemical shifts as compare to proton spectra; however the positions of resonances are usually determined via the similar factors. Though, for simplicity of interpretation, they are often recorded as decoupled spectra to remove the effects of coupling to adjacent protons that would otherwise split the carbon-13 resonances according to the n + 1 rule and Pascal's triangle. 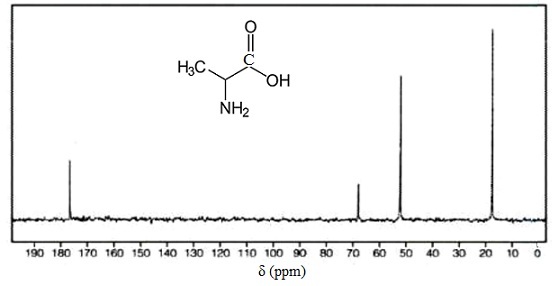 Decoupled spectra comprises of a single peak for each chemically dissimilar carbon in the molecule and spectra interpretation is confined to the correlation of their chemical shifts with structure, augmented through reference to chemical shift data and the spectra of known compounds. Proton coupling can be observed under suitable experimental conditions. 1) Note the presence or absence of saturated structures; generally provide resonances between 0 and 90 ppm. 2) Note the presence or absence of unsaturated structures in the region between around 100 and 160 ppm. (The alkyne carbons are exceptions appearing between 70 and 100 ppm). 3) Note any low field resonances (160 to 220 ppm) that are related by carbonyl and ether carbons. Carboxylic acids, anhydrides, esters, amides, acylhalides and ethers are all found in the range 160 to 180 ppm, whilst aldehydes and ketones lie between 180 and around 220 ppm. The three carbons exhibit a very broad range of chemical shifts. The lowest field resonance corresponds to the carbonyl carbon that is highly deshielded by the double-bonded oxygen. The nitrogen deshields the CH carbon much less, and the CH3 carbon is the least deshielded of the three.